Namibia, located in southern Africa, is a middle income country, well known for its rich biodiversity and abundant mineral reserves. Namibia is blessed with a number of minerals. the major ones being uranium, diamond, cobalt, nickel, iron and precious and semi-precious stones. In Husab and Rössing, Namibia houses the world’s largest uranium mines. Namibia also has the richest marine diamond deposits in the world, with an estimated resource potential of over 1.5 billion carats. The mining sector is one of the most regulated one in the country, a fact clear from the exhaustive and comprehensive list of mining and environmentrelated acts and regulations. The Mining Act, enacted in 1992, is the centrepiece legislation governing the sector. Subsequently, the Environment Management Act of 2007 and the Environmental Impact Assessment Regulation of 2012 were enacted for environmental management. Both the acts and the regulation broadly cover the environmental aspects of the mining sector. 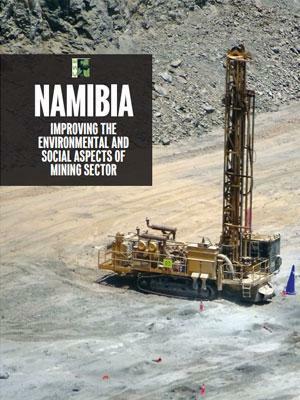 Namibia’s mining laws and regulations are predominantly industry-centric and focussed on boosting investment in the sector. Aspects like benefit sharing, corporate social responsibility, strengthening of local content plans, and insurance against damage to environment and the community are under consideration to make mining policies environmentally and socially responsible. Further, the implementation of policies requires strengthening of institutional capacity through proper guidelines, manuals, and standard operating procedures (SOPs) for ensuring effective enforcement and compliance.